Small town Liquor loot: Cat and mouse games continue! 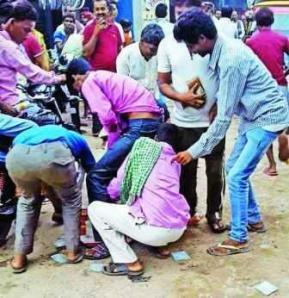 People in Nabinagar cocked a snook at the State prohibition policy, when they grabbed and made off with pouches of ‘illicit’ country liquor from cartons that had fallen on the road. The helpless police arrived at the scene too late. Nabinagar , 169km southwest of Patna,is a town in Aurangabad district, and the incident happened yesterday (June 29). The ‘liquor loot’ photographed by an onlooker that appeared in the media. It was hilarious, say those who witnessed the scene. It seems the event occurred around 11am, when cartons fell off a speeding motorbike. It was a fairly busy road. A carton split open, and lo and behold! Pouches of Jharkhand made hooch were scattered across the road. The two bootleggers on their motorbike didn’t look back. The police station was not far from the spot. The cartons fell, some of the pouches tore, and the liquor started flowing. Agile passers by, spotting the windfall, swooped down on booze. Those riding motorbikes stopped and started collecting the pouches. There was a mad scramble for the ‘preciou’s liquor.Within five minutes all the pouches were gone, said observers. The Nabinagar police station is some 500 metres from the spot. By the time the cops arrived, after being informed about the loot of liquor, the people had escaped with the booty. Obviously, the bootleggers wouldn’t be around to retrieve their stock ! “It was a gala time for the residents who got liquor free of cost,” admitted a rueful policeman. Bihar has the most draconian prohibition rules. Even possession of liquor is a non-bailable offence.”Sale, consumption and possession of liquor is banned in the state since April 2016. Those found to be flouting the rules will be liable for punishment under the provisions of Bihar Prohibition and Excise Act 2016,” SHO Prasad declared. The machinery in Patna has begun to breathe down the necks of the hapless police officers. The local launched investigation to ascertain the identity of the bootleggers has started. The investigating officials have been asked to trace the motorbike which was being used in the delivery of the consignment. “It is our top priority to nab the offenders,” the SHO said. What is crystal clear is that Chief Minister Nitish Kumar’s nanny state prohibition policy isn’t working. With all the threats and laws and arrests and harrassment, even the locking up of a hapless foreign national, the ordinary Bihari is willing to take any risk to get his hand on a tipple. Legally all those poor chaps who picked up a pouch or two have become ‘hardened criminals’ in the letter of the law. The law abiding elite just make a few trips to a neighbouring state for a boozing break, and take care to return back sober. In the meanwhile, the poor are being stuffed into overflowing prisons with no hope for bail. The young are turning to hardline narcotics. The hospitality industry has hit a low. Government servants mouth empty platitudes in favour of prohibition in government events. Nobody is fooled. This cat and mouse game continues in Bihar.